This advanced, dairy-free supplement from OptiBac contains 5 extensively researched strains, such as Lactobacillus acidophilus NCFM®, in an extra strength dose of 20 billion live microorganisms per capsule. This includes 5 billion live cultures of L. acidophilus NCFM® alone, which is thought to be the most researched strain of acidophilus in the world. 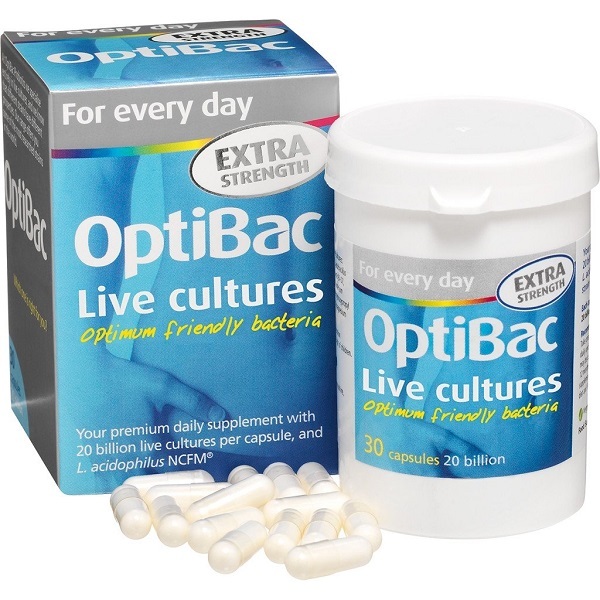 All of the friendly bacteria in OptiBac ‘For every day EXTRA Strength’ (formerly known as ‘For daily wellbeing EXTRA Strength’) are scientifically proven to pass through stomach acidity to reach the gut alive. What’s more, this natural supplement is free from sugars, fats and flavourings that may be found in other food & drinks containing live cultures. As a company we value quality over strength. Whilst this product contains an impressive 20 billion microorganisms per capsule, it’s the premium research behind the strains that we like to shout about! Each capsule guarantees 20 billion live cultures. Suitable for vegetarian and vegan diets. Storage: Like the rest of the OptiBac range, ‘For every day EXTRA Strength’ does not require refrigeration. Store out of direct sunlight.